This decorated velvet kippah (yarmulke) is popular among contemporary Jewish boys. Jewish law requires men to cover their heads as a sign of respect and reverence for G‑d when praying, studying Torah, saying a blessing or entering a synagogue. This practice has its roots in biblical times, when the priests in the Temple were instructed to cover their heads. These kippahs are popular in Israel. Although it is not explicitly required by law, the practice is noted in the Talmud, and through the ages, this became an accepted Jewish custom to the point that according to the majority of halachic authorities, it is mandatory. One should, therefore, not walk or even sit, bareheaded. Small children should also be taught to cover their heads. Aside from the common black kippah, many wear kippot (plural form of kippah) of various colors or designs. Some communities have developed kippah designs that are highly intricate works of art, such as those made by Jewish artisans from Yemen and Georgia, most of whom now live in Israel. Lorne E. Rozovsky (1943-2013) was a lawyer, author, educator, a health management consultant and an inquisitive Jew. Why Do We Wear a Kippah? For Joanne 1. He might have lost it on the way to the office. Seriously. I had that happen to me twice! Once, it blew away in a strong wind. On the other ocassion, I fell asleep on the commuter bus and my kipah fell off while I was asleep; I didn't realize it was gone until after I'd exited the bus. 2. He might possibly be feeling some pressure at work to not wear it. On my college campus, I have felt quite a bit of pressure regarding my observance. Given that, technically, some rabbis hold a man can claim the roof as a head covering while indoors, it might be that he was trying this option out. If so, he would then only 'need' to cover his head while outdoors or praying/learning. In the early 20th century, many to most orthodox men did not wear their kippot to work unless they worked for a Jewish establishment, and they used this paradigm. The custom of wearing a kippah is in order to be constantly aware of G-d's presence. Women, being more intuitively spiritually aware than men (see Golden Calf, Spies, Complaints of Meat, etc.) and possessors of more powerful faith, do not need such a reminder. Why not? Even the most Orthodox children wear kippot with teddy bears and such on them. I have never seen a kippah with a design such as the one you are interested in, though, so you will have a hard time finding one. Richard, the Jewish men you know are probably non-observant (unorthodox) Jews. Generally speaking, only Orthodox Jewish men wear kippot. Approximately 10% of American Jews are Orthodox. Richard's response might not be exactly what it seems. Sometimes, Jewish men brought up in non-observant homes struggle with the concept of wearing a kippah in public. Richard might fall into this sub-population of Jews. Thanks for the clarification on "Jewish Law" (Shuchan Aruch). 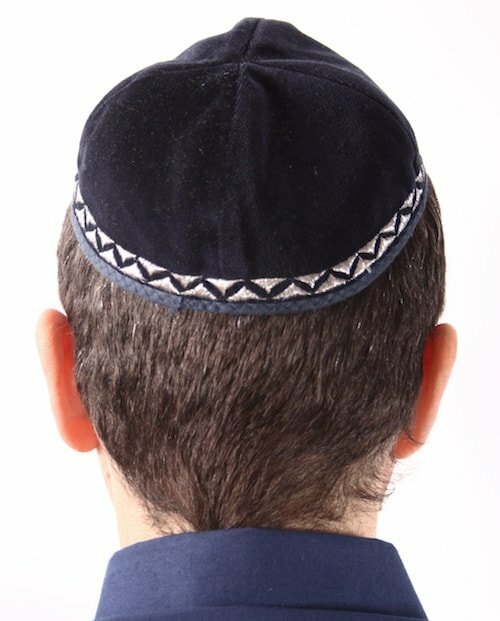 In that seemingly most Jewish men do not wear the Kippah, well what does that mean? Also, any thoughts on the large black brimmed hats question that don't seem to fit? Is this more stylistic than anything else? Generally speaking, only Orthodox (observant) Jews wear yarmulkes (the small black skullcap). Charedi Jews (Chasidim, Litvaks, Yekkes) will also wear a formal black hat of some sort over their yarmulkes. "Jewish Law" or "Judaic Law?" First, I'm ignorant and this is a genuine question. Regarding your brief explanation of the Yarmulke or Kippah you state "Jewish law requires men to cover their heads ...." But would that be Judaic law since there are so many Jews who are not religious nor observant. Is it, perhaps more technically correct, to consider it a law/requirement of Judaism as a religion? What would "Jewish law" be? I mean even in Israel more Jewish men don't wear the Kippah than do. Litvaks (yeshivishe Jews) also wear small black yarmulkes under a 3-inch-brim black fedora. As I posted a correction earlier, it is mentioned in (Exodus 28:4) not in (Exodus 27:4).